Jacksonville Jaguars' A.J. Bouye (21) tackles Jacksonville Jaguars' Leonard Fournette (27) during the first half of an NFL football game on Sunday in East Rutherford, N.J. The Jacksonville Jaguars are riding their defense once again, and hope it takes them beyond the AFC title game. 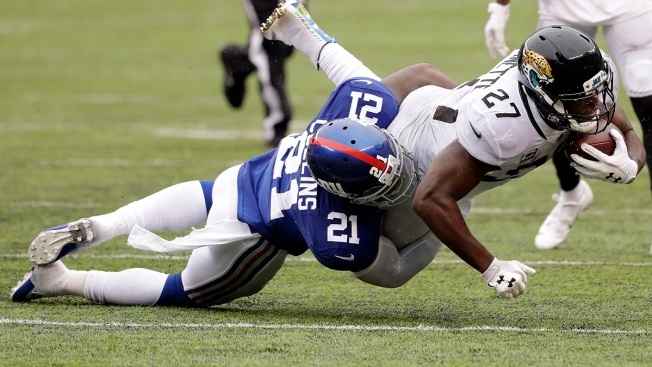 Linebacker Myles Jack scored on a 32-yard interception return early in the fourth quarter and the Jaguars spoiled the New York Giants debuts of coach Pat Shurmur and second-overall draft pick Saquon Barkley, and the return of Odell Beckham Jr. with a 20-15 win on Sunday. Coming off a season in which they were ranked No. 2 overall and scored seven touchdowns on turnovers, the Jaguars' defense showed no slippage - with the exception of a spectacular 65-yard run by Barkley. The had two sacks, six quarterback pressures, eight tackles for losses, stopped a 2-point conversion run Barkley and didn't give up the lead late, stopping a New York drive with 1:55 to play. A season ago, the Jaguars blew a 10-point, fourth-quarter lead to the Patriots in the conference championship. "We feel we're so talented on defense," said Jack, who scored on a pass deflected by backup nose tackle Abry Jones and finished with a game-high 10 tackles. "We've got DBs that can score, linebackers can score. Even D-linemen who can strip sack fumbles and score. We don't put any pressure on the offense. If the offense scores, it puts even more onus on us. We try to create points." The Jags' offense did just enough playing without top running back Leonard Fournette (hamstring) most of the game. Blake Bortles, who was 18 of 33 for 176 yards, threw a short touchdown pass and led two other first-half field goal drives. The Jaguars gained 310 yards in total offense and didn't score as a unit in the second half. The team also had 11 penalties for 119 yards. "Our defense bailed us out and played pretty well," Bortles said. "For us to find a way to win is a good start." The Giants, who were 3-13 last season, had their chances after falling behind 19-9 on Jack's touchdown. Held in check much of the game, Barkley (18 carries for 106 yards) brought the sellout crowd to its feet less than a minute after Jack's score with a spectacular run. He took an inside handoff, broke to the outside, got a great block by receiver Sterling Shepard and scored, getting New York within 20-15 with 10:39 to play. His 2-point conversion was stopped. "I'm encouraged just because I have seen the way we work and the men we have in this locker room," Manning said. "The talent that we have and guys taking care of each other. Just encouraged by the whole situation. We can get things going and we can play at a high level. We will make it work." The Jaguars led 13-6 at the half as Bortles methodically took his team on three scoring scores. Josh Lambo capped the first two with 39-yard field goals, and Bortles hit backup running back T.J. Yeldin from 1 yard for a 13-3 lead. Beckham, who broke an ankle on Oct. 8 and did not play in a preseason game, drew two pass interference penalties on the ensuing drive. Rosas closed the gap to a touchdown with a 31-yard field goal with :04 left in the half. He added a 44-yarder on the opening series of the third quarter on a drive helped by a ugly facemask penalty by Yannick Ngakoue against Barkley. Manning targeted Beckham 15 times and connected on 11. The NFL's highest-paid receiver also drew pass interference penalties of 30 and 15 yards late in the first half, setting up a Rosas field goal. Jaguars CB Jalen Ramsey and LB Telvin Smith Sr. stood for the anthem. They stayed in the locker room in the preseason. Both teams stood. Jaguars: Fournette was hurt in second quarter. He finished with 41 yards. Giants: Backup RB Wayne Gallman left in the second half with a knee injury. He said he was OK after the game. Jaguars: Home opener next Sunday against New England, the team which beat them in AFC title game. Giants: Visit Dallas for Sunday night game.